Linha Vermelha is a national awareness campaign to stop oil drilling & fracking in Portugal. They want to knit 52 Km, the longest red line in the world, to mobilise people to say a resounding NO! to fossil fuels. There are currently nine active drilling and fracking contracts in Portugal, located in the Algarve and Alentejo coast line, as well as close to Peniche and about 20 km inland. They are active, but no drilling or fracking has occurred yet. 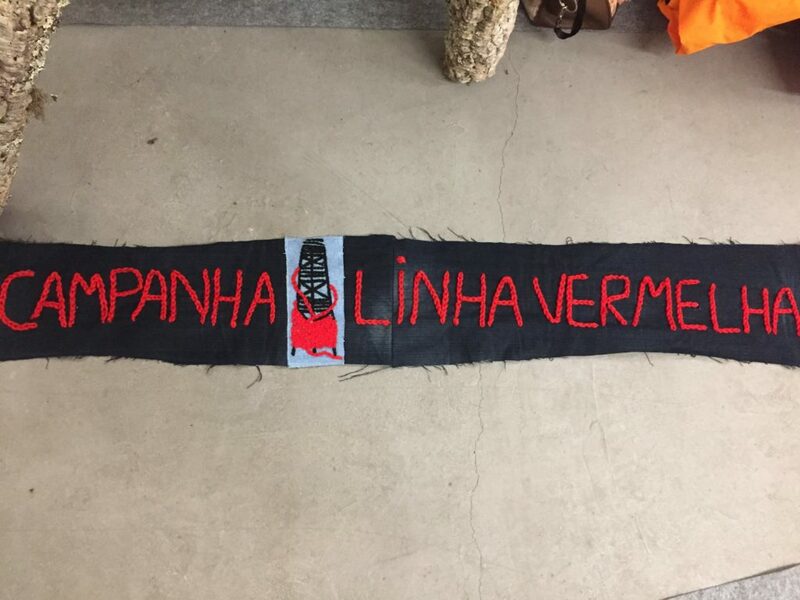 The goal of Linha Vermelha is to cancel these contracts by putting pressure on the Portuguese government through people’s mobilisation and press coverage. 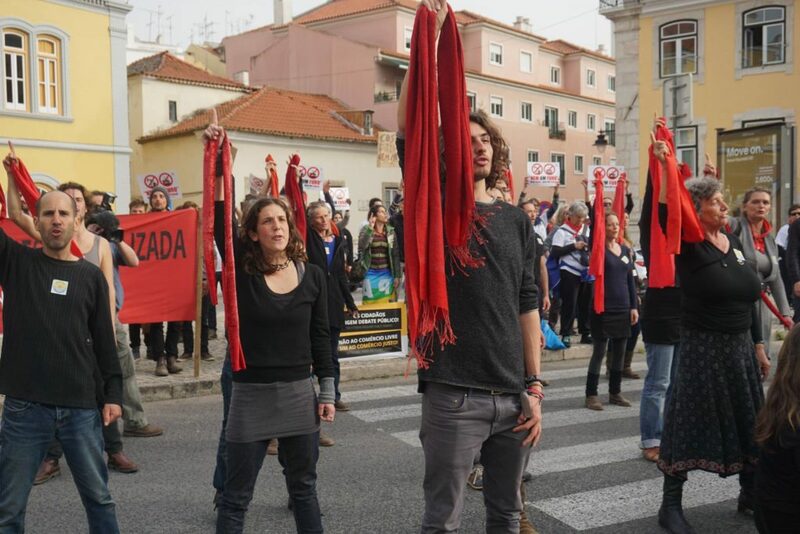 The issue with people’s mobilisation is that there’s a huge lack of awareness regarding the negative impact of drilling & fracking, and oftentimes these activities are seen as viable economic solutions for Portugal. Moreover, there is a big awareness gap between ecologists, activists and people who live along parts of the coast with nature or tourism traditions, and the rest of the population. This, coupled with a historical lack of political participation, and press conglomerates that are controlled by corporate interests, makes it extremely hard to engage in an open discussion around drilling and fracking. Furthermore, the current campaigns on drilling/fracking are mainly local, addressing only their very immediate local needs. This creates an activism ecosystem which is often competitive, rather than collaborative, making it hard to scale up activism activities to a national level. Who can resist a little, knitted, red octopus this cute? These challenges have been turned into an opportunity, via the creation of the “Linha Vermelha” campaign, which uses a lighter approach to activism that is easier for people to embrace. 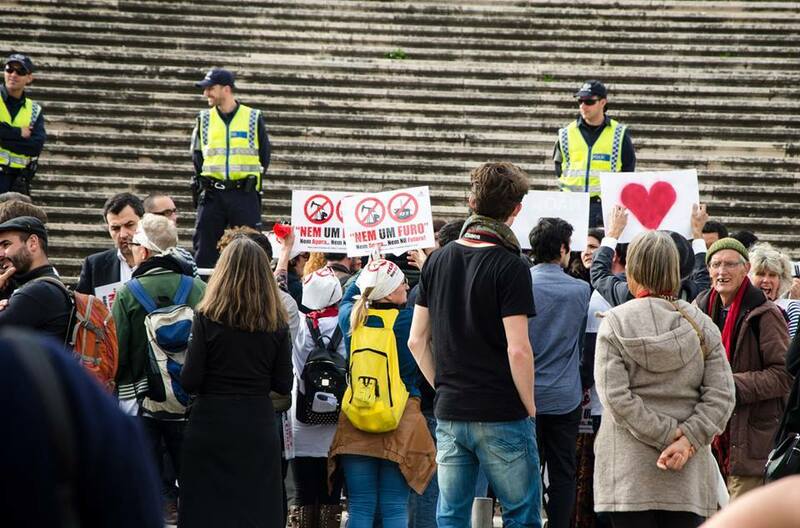 They are trying to target non-activists who are normally not targeted in activism campaigns, however they are one of the few national anti-drilling and fracking campaigns in Portugal altogether. “Linha Vermelha” is quite a recent campaign, having started only in November 2016. Despite the short duration, they’ve already had a few successes. 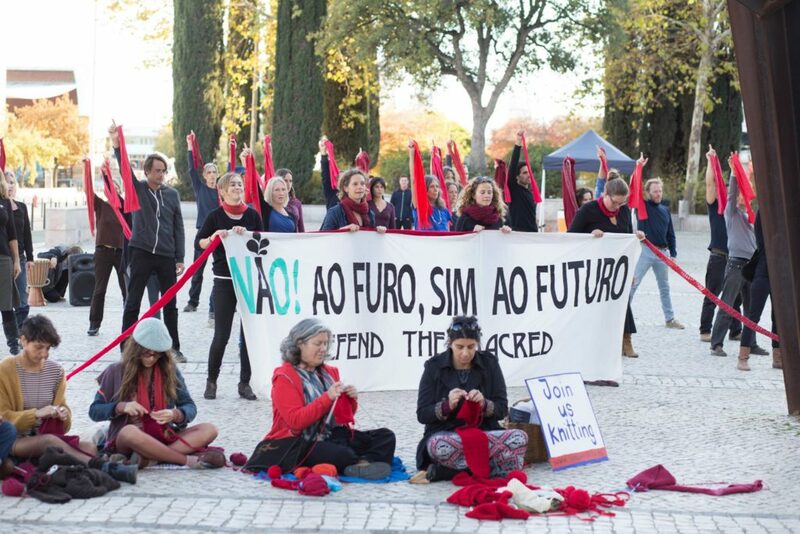 They’ve had more mobilisation regionally than in Lisbon, which is the opposite of what usually happens, and now there are 10 regional knitting clusters in Sines, Lisboa, Porto, Bragança, Odemira, Aveiro, Sintra, Olhão, Algés, Oeiras, Loulé, São Brás de Alportel, Entroncamento and Leiria. The team is also receiving red lines from Spain, Australia, United Kingdom and the United States of America. Moreover, they’ve successfully engaged with regional activism groups, and have joined in local actions while organising both local and national events with arts and civic centers. It is imperative to actually create awareness and mobilisation of non-activists before the drilling and fracking starts, thus contributing to a prevention culture. They are promoting an active-citizenshop mindset and doing so by utilising a “lighter” approach to activism and engaging people who otherwise would not be interested. Widescale popular opposition against oil drilling and fracking will be key to preventing large infrastructure development projects and it is not enough for this to remain a fringe issue of environmentalists alone. This campaign is laying the foundations for the first national climate justice movement in Portugal. Grandma power! A truly diverse movement that includes movement builders, leaders and followers of all ages. One of the key lessons the Linha Vermelha team have learned since their inception in late 2016 is that gentle activism is a powerful, unifying tool. It is an intention and mindset more than a tangible tool, because there are numerous practices one can develop that would fall under the gentle activism approach. Knitting is just one such example. A fun, accessible activity that involves the rewarding feeling of having learned a new skill as well as engaging with a diverse group of people is what gentle activists need to be going for. 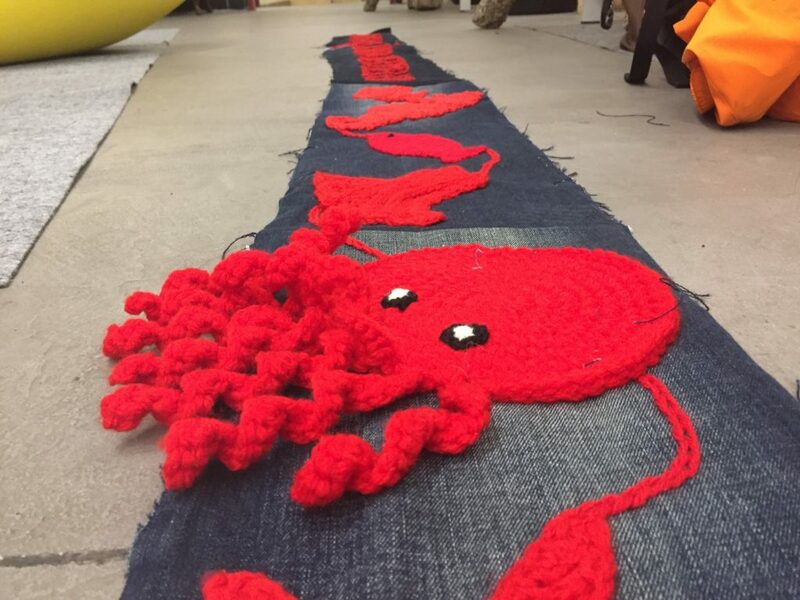 There is a budding movement particularly within craftivism (blending crafts and activism) to to just this, politicise arts and get people connected and engaged with society-shaping goals. Sarah Corbett is one such gentle activist leader, running the craftivist collective in the UK, you can read more about how gentleness can be a powerful tool in activism here and you can also listen to an interview with her from another Guerrilla grantee, Upstream here. Finally, ‘word of mouth’ is very important in maintaining close connections between the knitters as this is a very social campaign and really depends on human relationships. In addition, since it is important to make the red line bigger and more visible, having some sort of gamification around the campaign with length targets, makes it all more fun while also helping people understand the urgency behind the end goal. So what does a national campaign’s to-do list look like? – Contact regional groups: schools, knitting circles, elderly centers and other local organisations and companies (email, phone, face to face) and support their regional events with communication materials. The goal is to have a decentralized campaign and to have regional groups massively contributing for the 52 Kms. They will also support them with knitting materials if necessary. – Press coverage: create national and regional press releases, contact daily TV shows and media outlets, create stories around “craft activism”, get support of celebrities and ambassadors and use their image. – National Event and Gathering:Organize one national knitting event to bring together all regional groups. Organize one national gathering to bring together anti drilling and fracking activists, and climate justice leaders. – Sponsorship and fundraising: contact companies and wool manufacturers to get sponsorship either in kind or money. Organize an online crowdfunding campaign for wool and money. – Consolidated national strategy “Linha Vermelha”: Draft a “Linha Vermelha” strategy for the next three years, rework theory of change and logical model. – Digital marketing: Website and social media updates, social media ads. Comms material production. Create a “Linha Vermelha” activism kit to be downloaded and used by anyone around the world. Update flyers and brochures. Create banners. Produce two videos: institutional campaign video with celebrities, and one short video explaining the drilling and fracking issue.